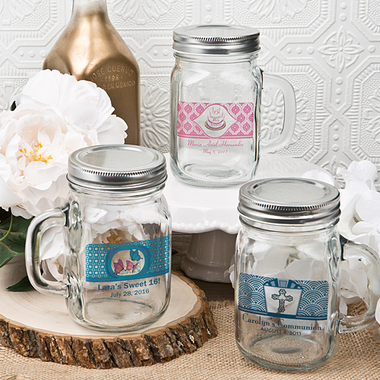 Ideal for every type of occasion, use these mason jars to hold honey, jam, candy or any other after-party treat you wish to gift your guests. Personalize the jars with a print and message that matches the theme and colors of your party, and you have a customized party favor that your guests will enjoy. Each square glass jar with a handle is 4 3/4" tall x 4" wide and can hold 12 oz. A silver metal screw top with tight seal is included as are custom labels for you to apply.